Periodontal (perry-o-DON-tal) Disease is an infection and inflammation that affects the tissues and bone that support your teeth. It's also called gum disease. A surprisingly wide variety of bacteria are normally found in your mouth. When certain types of bacteria outgrow the others, this starts the process of gum disease. When your gums are healthy, your gum tissues tightly hug each of your teeth. When you have gum disease, your gums pull away from your teeth. 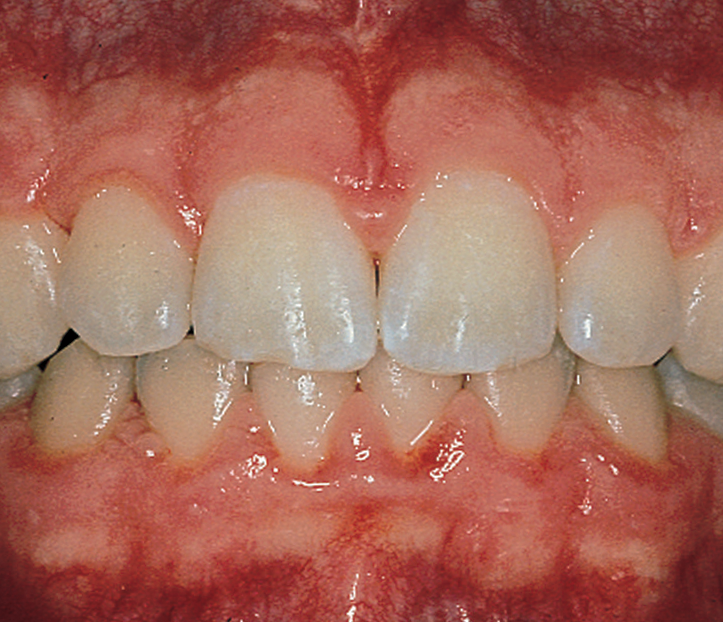 As the gum disease gets worse, the tissues and bones that support your teeth become damaged. Over time, your teeth may fall out or need to be removed. Treating periodontal disease in the early stages can help prevent tooth loss. What is the connection between gum disease and other health issues? Gum disease has been linked to some other diseases. People with diabetes or heart disease are more likely to get gum disease. Strokes and high stress also may be related to gum disease. Researchers are still studying these links. It is important to talk to your dentist if you suffer from any long-term health problem. Together, you can work out an oral care plan for your best oral and overall health. If you notice any of the signs below, see your dentist. However, you can have gum disease and not notice any of these warning signs. That is why regular dental checkups are very important. Plaque is a sticky film of bacteria that is always forming on your teeth. 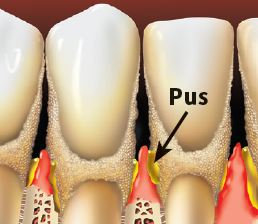 Bacteria that live in the plaque can make your gums become red, puffy and swollen. When plaque is left on your teeth and gums, it hardens. 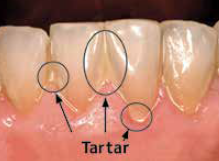 Hardened plaque is called tartar (TAR-ter) and can only be removed when your teeth are cleaned in the dental office. When your gums are red, puffy and swollen, they can start to pull away from your teeth. Spaces called pockets start to form between your gums and teeth. These pockets give bacteria a place to collect and grow. The bacteria in your pockets will cause your gum disease to get worse. These bacteria produce toxins, which causes your body to break down the gum tissues and bone around your teeth. • Brush your teeth twice a day with a fluoride toothpaste and for 2 minutes each time. • Clean between your teeth with floss or another between-the-teeth cleaner every day to remove plaque and food from areas your toothbrush can't reach. 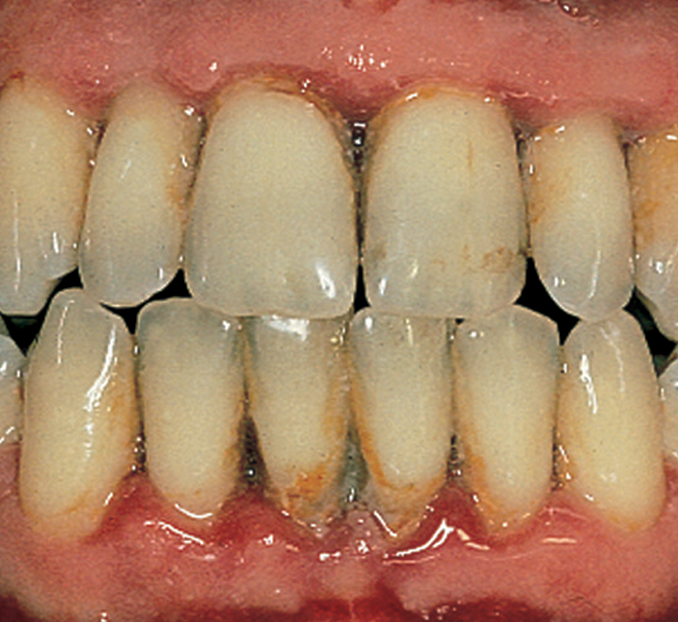 • Your dentist or hygienist may recommend using a germ-killing mouthrinse or other products. • Eat a healthy diet and limit snacks and sugary drinks. Learn more online at www.choosemyplate.gov. If you smoke, chew, or dip tobacco, then it is very important you quit. Using tobacco in any form slows down your healing and raises your chances of getting gum disease again or it getting worse if you already have it. Talk to your dentist or doctor about ways you can quit. • Not taking care of your teeth and gums. • Using tobacco of any kind. • Diseases that affect the whole body - such as diabetes and HIV infection. • Pregnancy, use of birth control pills, or changes in female hormone levels. • Passing the bacteria that causes gum disease through saliva. Your teeth are held in place by gums, bone and connective tissues. 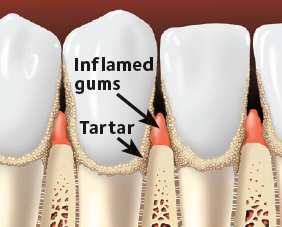 Your gums tightly hug your teeth and there is little or no buildup of plaque and tartar on them. 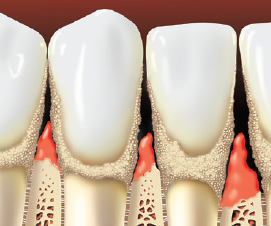 The bacteria in plaque make your gums red, tender and swollen. Your gums might bleed at this stage. You can also have gingivitis and not have any signs of it. In time, your body responds to the toxins that the bacteria produce by breaking down the gum tissues and bone around your teeth. Your teeth become loose or fall out or need to be removed by a dentist. Loose or missing teeth can create problems, like making it hard for you to eat the foods you like. Your dentist or hygienist uses an instrument called a periodontal probe to gently measure the depth of the pockets around each tooth. 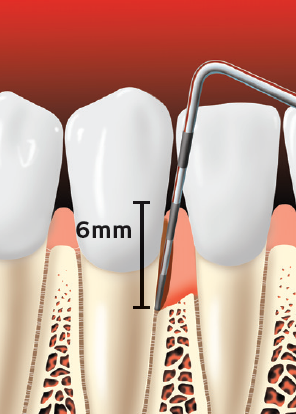 When your teeth are healthy, the pocket depth is 3 millimeters (mm) or less. 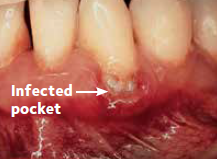 Usually, the more severe the disease, the deeper the pocket, which give bacteria more room to grow and cause serious damage to your teeth, gums and bone. 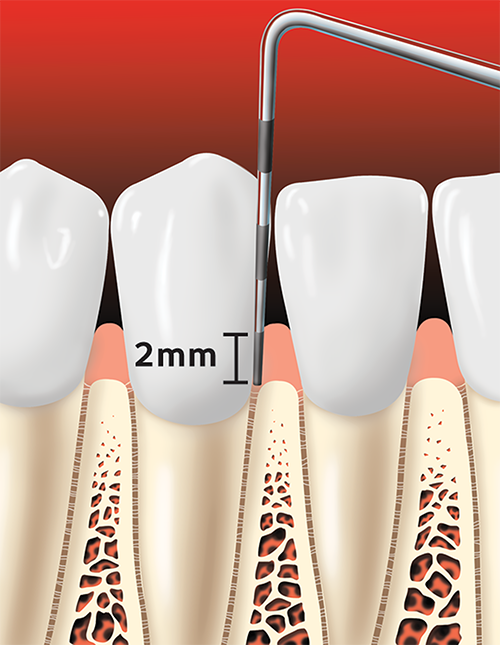 Periodontal probe showing a pocket forming between the tooth root and the gums. 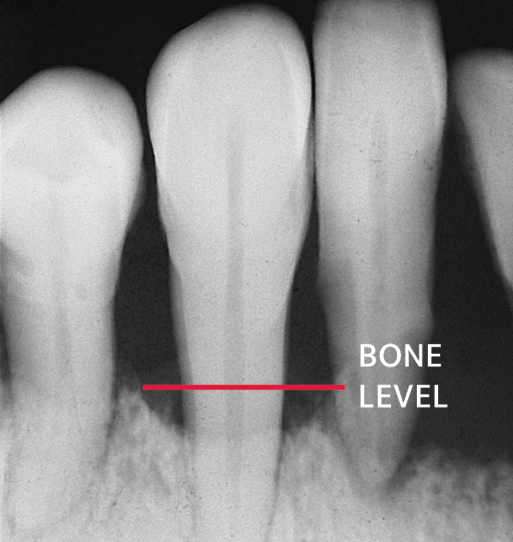 Dental x-rays can check on the amount of bone that is supporting your teeth. 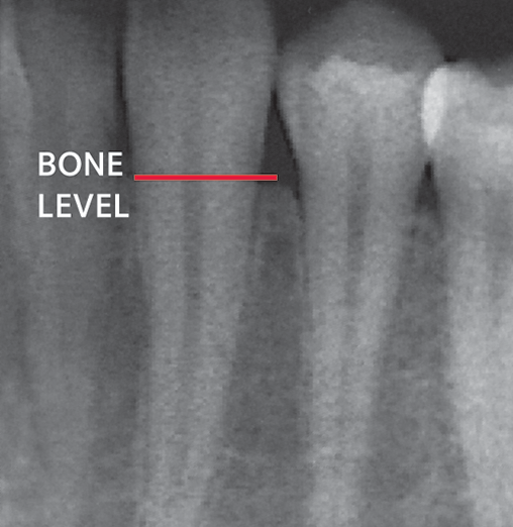 If low bone levels are spotted, it could be a sign of damage from gum disease. Healthy gums have bone that supports the teeth. 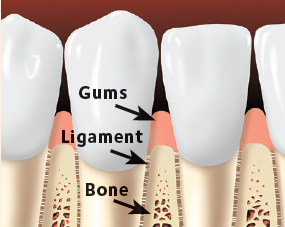 Gum disease can create bone loss. 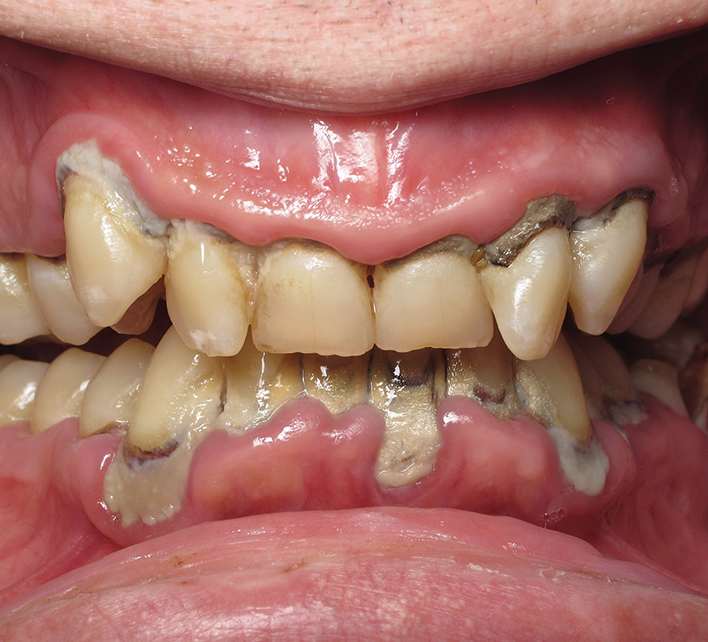 You don't have to lose teeth to periodontal disease. Brush, clean between your teeth, eat a healthy diet and schedule regular dental visits for a lifetime of healthy smiles. 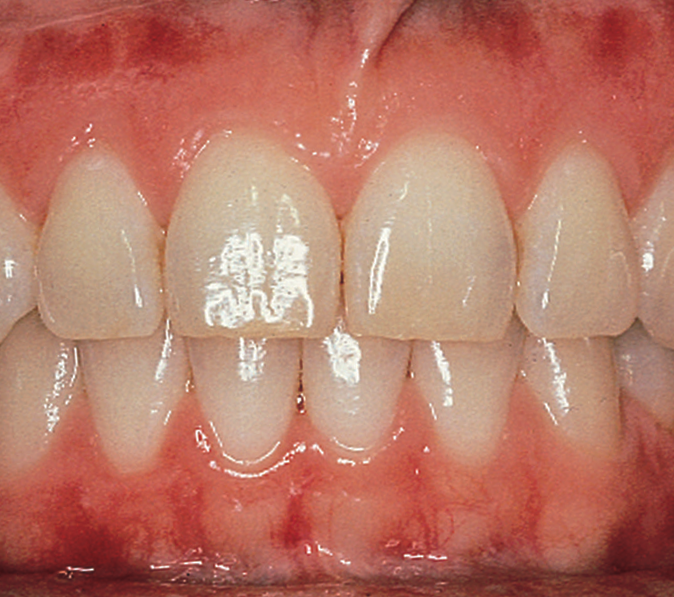 Advanced Periodontitis image courtesy of Dr. John C. Hall.